Bayesian Networks are graphical probabilistic models that represent the relations and probability distribution between a large set of interrelated variables. A BN is composed of a graphical structure and a set of parameters. The graphical structure of a BN is composed of nodes that represent variables and arcs that represent causal and associational relations between those variables. The numerical parameters of a BN represent the strength of those relations in terms of conditional probability distributions. Powerful algorithms which can compute complex probabilistic inferences with given information, are available for BNs. 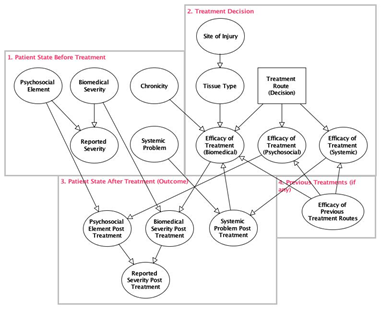 BNs have been a popular approach for developing clinical decision support models due to their unique features such as providing decision support with partial information and to revise its computations when more information is entered. Moreover BNs offer a suitable medium for combining clinician’s knowledge and published evidence with patient datasets. The graphical structure of a BN is suited for representing clinical understanding about causal relations and disease mechanisms. The strength of relations in the structure can be learned by multiple sources including data, expert knowledge and published statistics. Moreover, BNs can generate information with partial information as it can make probabilistic computations when any subset of its variables are observed. The probabilities are revised if more information are entered. This suits the practice in most clinical problems as clinicians diagnose and treat diseases with partial information, and they ask for additional tests and observations if they want more certainty. BNs can quantify and present this uncertainty to clinicians.